In the hot seat: Joelle’s journey from the dole to a global role. Brisbane Times. December 30. (Dr Joelle Gergis). Earthrise, a photo that changed the world. The Conversation. December 21. (Dr Julie Arblaster). Antarctic cloud pattern study helping scientists unravel climate change secrets. ABC News Online. December 17. (Dr Robyn Schofield). Scientists address climate change and what it really means for climate change. The West Australia. December 16. (Dr Jatin Kala). Scientists continue to issue urgent warnings about climate change. 7:30 (ABC1). December 13. (Prof Andy Pitman). Local climate health research inadequate. Climate Control News. December 7. (Prof Andy Pitman, Dr Sarah Perkins-Kirkpatrick). Australia unprepared for climate change impact on allergies. Mirage News. December 6. (Prof Andy Pitman, Dr Sarah Perkins-Kirkpatrick). Climate change ramps up allergy threats. Open Forum. December 6. (Prof Andy Pitman, Dr Sarah Perkins-Kirkpatrick). Greenland ice melt is on ‘over drive’, with no signs of slowing. Inside Climate News. December 5. (Assoc Prof Nerilie Abram). Bushfires and other extreme weather events. Life Matters, Radio National, ABC. December 4. (Dr Sarah Perkins-Kirkpatrick). Queensland’s ‘abnormal’ bushfires linked to climate change. ABC News Online. December 1. (Dr Sarah Perkins-Kirkpatrick). IAG says extreme weather events consistent with climate change. Australian Financial Review. November 30. (Dr Andrew King). Why our weather events will only get worse. news.com.au. November 30. (Dr Andrew King). BoM’s summer outlook expects above average temperatures and dry in the north. ABC News. November 29. (Dr Shayne McGregor). Past warming events in the Arctic linked to shifting winds in the Antarctic. Nature. November 28. (Dr Nerilie Abram). WeatheX app launches to help scientists better understand wild weather. Wollondilly Advertiser, Camden-Narellan Advertiser. November 21. (Dr Joshua Soderholm, Alvin Stone). Why predicting the weather and climate is even harder for Australia’s rainy northern neighbours. The Conversation. November 19. (Dr Andrew King, Dr Claire Vincent). Call for citizen scientists to use Weathex app to record extreme weather events and improve forecasting. Kids News. November 18. (Dr Joshua Soderholm). New weather app ‘a quantum leap’ for understanding extreme events. ABC Online. November 16. (Dr Joshua Soderholm). Forecasting perfect storms. Cosmos Magazine. November 9. (Prof Andy Pitman). Democrats plan to revive a House committee on climate change that the GOP dissolved. Inquisitr. November 8. (Dr Andrew King). Great Barrier Reef: “last chance” tourists flock to world wonder as coral disappears. Deutsche Welle. October 30. (Dr Sarah Perkins-Kirkpatrick). Murray-Darling Authority accused of maladministration and ignoring best science. The Guardian. October 30. (Prof Andy Pitman). Stilling: the curious case of land wind-speed decline. ABC Online. October 27. (Prof Michael Roderick). Stormchasers called on to contribute to climate science app. The West Australian, Pilbara News. October 23. (Prof Christian Jakob, Dr Joshua Soderholm). A new storm app. Channel 7 Brisbane. October 17. (Dr Joshua Soderholm). New extreme weather app: Help scientists map severe storms. Northern Star. October 17. (Dr Joshua Soderholm, Prof Christian Jakob). BoM crowdsources weather data to track and predict storms. IT News. October 17. (Dr Joshua Soderholm, Prof Christian Jakob). What the past can tell us about the future of climate change. Pursuit. October 16. (Dr Andrea Taschetto). 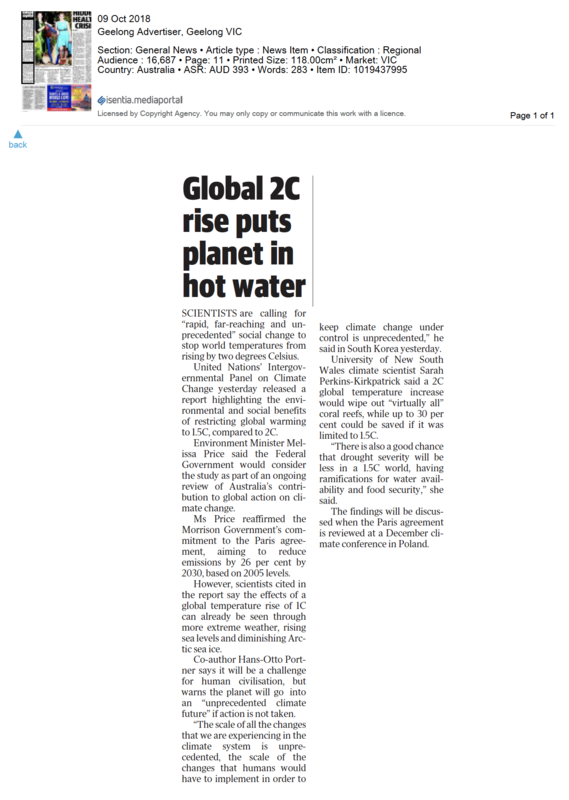 Climate coverage: News Corp’s contempt for climate change revealed in its coverage of last week’s IPCC report. ABC MediaWatch. October 15. (Prof Steve Sherwood, Dr Nerilie Abram). Does climate vary more from century to century when it is warmer? Knowridge Science Report. October 15. (Dr Laurie Menviel, Dr Andrea Taschetto). Global warming boosts century to century variability, study finds. UPI, AZO Cleantech. October 12. (Dr Andrea Taschetto). In a canter? Climate experts say Australia will not meet emissions targets. The Guardian, Yahoo News. October 11. (Prof Andy Pitman, Dr Sarah Perkins-Kirkpatrick). How to help fight climate change, because this new report says time is running out. Bustle. October 10. (Dr Andrew King). United Nations climate report warns Miami is basically screwed. Personal Tech MD. October 10. (Dr Andrew King). Growing Rain. Outdoor Design Source. October 9. (Prof Andy Pitman). Here’s what you need to know about that big UN climate report. Metro. October 9. (Dr Andrew King). Climate change if not controlled by 2030 will inevitably bring floods, extreme weather and kill coral reefs: IPCC. International Business Times. October 9. (Dr Andrew King). Ningaloo reef could be wiped out in 30 years, IPCC warns. The West Australian. October 9. (Dr Jatin Kala). UN climate report demands action. Energy Reporters. October 9. (Dr Andrew King). Climate change and agriculture. (Mp4 file) 7:30 ABC TV. October 8. (Dr Sarah Perkins Kirkpatrick). ‘Unprecedented’ action needed to survive global warming. CNet. October 8. (Dr Andrew King, Dr Jatin Kala). 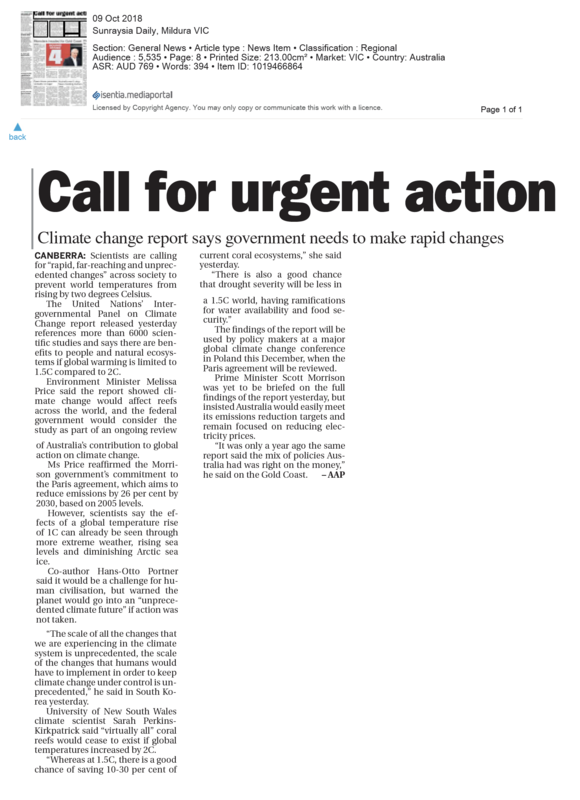 Climate report calls for rapid govt action. Daily Telegraph. October 8. (Dr Sarah Perkins-Kirkpatrick). IPCC climate change report calls for urgent action to phase out fossil fuels – as it happened. The Guardian. October 8. (Dr Sarah Perkins-Kirkpatrick). 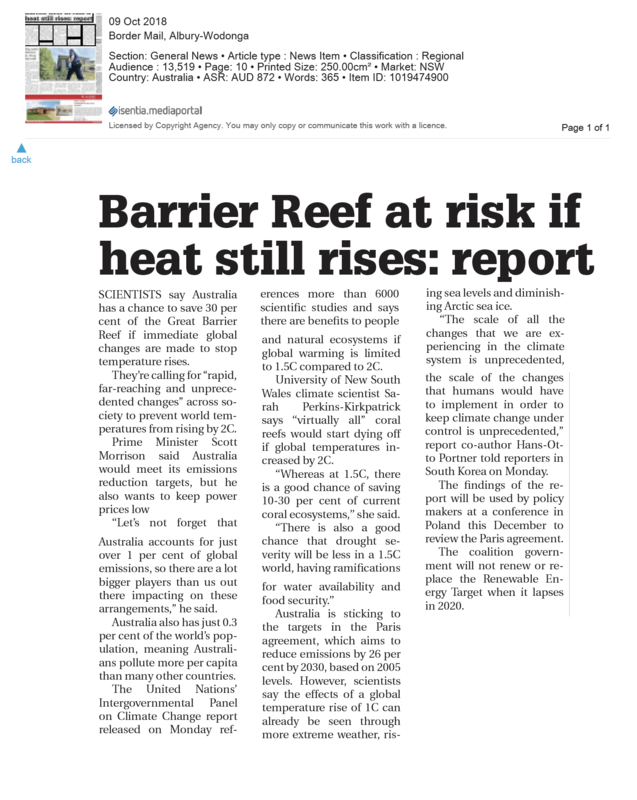 Barrier reef at risk if heat still rises: report. Border Mail, Sunraysia Daily, Geelong Advertiser. October 8. (Dr Sarah Perkins-Kirkpatrick). IPCC Report. ABC News. Triple J, Radio Sydney, ABC1 TV Melb/Syd. October 8. (Dr Sarah Perkins-Kirkpatrick). IPCC Report interview. Far North Qld ABC Radio. October 8. (Dr Sarah Perkins-Kirkpatrick). Trust me, I’m an expert: Cyclone season approacheth, but this year there’s a twist. The Conversation, MENAFN. October 8. (Dr Joelle Gergis). Planet has only until 2030 to stem catastrophic climate change, experts warn. News 4, Citizen Digital, CNN, News 4 Oklahoma, Channel 3000. October 8. (Dr Andrew King, Dr Sarah Perkins-Kirkpatrick). Terrifying climate change warning: 12 years until we are doomed. Fox News, New York Post. October 8. (Dr Andrew King). ‘Unprecedented’ action needed to survive global warming, UN says. CNet. October 8. (Dr Andrew King). Science and belief to collide on Smith’s stage. Riot Act. September 19. (Dr Nerilie Abram). When trees make rain: Could restoring forests help ease drought in Australia? ABC Online/Life Matters, September 15. (Prof Andy Pitman). Is Australia set to follow Europe and North America with an extreme summer? Pursuit. September 11. (Dr Andrew King). Australia on track to meet Paris targets due to renewables, report says. Triple J Hack. September 11. (Prof Andy Pitman). Cold green life: the climate scientist balancing Antarctic research and sustainable living. Cosmos. September 7. (Dr Nerilie Abram). Summer nights have never been hotter in the lower 48. The Weather Channel, USA Today. September 7. (James Goldie). Forecasting Perfect Storms. Cosmos Magazine. September 6. (Prof Andy Pitman). Australia burns while politicians fiddle with leadership. The Conversation, PV Magazine. August 22. (Dr Sarah Perkins-Kirkpatrick). Australia wilts from climate change. Why can’t its politicians act? New York Times. August 21. (Dr Joelle Gergis). NSW drought: Farmers frustrated by weather forecasts. AAP – The Northern Daily Leader, Bega District News, Eden Magnet. August 17. (Prof Andy Pitman). Sydney’s bushfire season starts in winter: ‘We may have to rethink how we live’. The Guardian. August 15. (Prof Andy Pitman). Experts argue why our farmers need to ‘get out’ instead of being bailed out. Ten Daily. August 9. (Prof Andy Pitman). Heatwaves and hope. Cosmos Magazine. August 8. (Dr Sarah Perkins-Kirkpatrick). SBS News. Hothouse globe (from 10:36) – MP4 file SBS News. August 7. (Prof Andy Pitman). Help can sometimes be more of a hindrance in flood rescues. Sydney Morning Herald. August 6. (Prof Todd Lane). Sydney sweats through warmest July on record as State endures devastating drought – with Australia’s south coast on track for a windy week as Perth eyes down torrential downpour. Daily Mail Australia. August 5. (Dr Sarah Perkins-Kirkpatrick). BOM weather: Hottest July on record for southern Queensland prompts warnings of more to come. ABC Online. August 1. (Dr Sarah Perkins-Kirkpatrick). Is climate change to blame for Europe’s record heatwaves? SBS, July 31. (Dr Andrew King, Dr Sarah Perkins-Kirkpatrick). ‘Unique and alarming’: Engineers to be tested as rain events intensify. Sydney Morning Herald. July 30. (Prof Todd Lane). Climate change made current European heatwave more than twice as likely, scientists conclude. The Independent (UK). July 27. (Dr Andrew King). Current heatwaves are linked to climate change, scientists confirm. Deutsche Welle. July 30. (Dr Andrew King). Aussie-linked research identifies key mechanisms of El Niño global weather events. Xinhua News. July 26. (Dr Dietmar Dommenget). Media reaction: The 2018 summer heatwaves and climate change. Carbon Brief. July 26. (Dr Ben Henley, Dr Andrew King). Freak weather sparking mayhem may linger as Europe and Asia swelter. Bloomberg, Insurance Journal, Property Casualty 360. July 25. (Prof Andy Pitman, Dr Andrew King). Arctic circle reaches 30C as freakish temperatures set to stay put for weeks. Business Day. July 25. (Prof Andy Pitman, Dr Andrew King). EPA to monitor air quality in the Blue Mountains. Blue Mountains Gazette. July 20. (Prof Jason Evans). Why temperatures at night are going up around the world and what we can do about it. ABC Online. July 19. (James Goldie, Stephanie Jacobs). The climate has always changed. Why is this time so much worse? Nexus Media. July 19. (Prof Katrin Meissner). How an alien seaweed invasion spawned an Antarctic mystery. The Conversation. July 17. (Dr Adele Morrison, Prof Andy Hogg). Foreign plants, animals can “surf” to Antarctica. Canberra Times. July 17. (Dr Adele Morrison). Record-breaking seaweed that travelled 12,500 miles to Antarctica proves animals including worms and snails could one day use ‘living’ rafts to populate the icy continent. Daily Mail (UK). July 17. (Dr Adele Morrison). Kelp is undertaking epic voyages to reach Antarctica. IFLS. July 17. (Dr Adele Morrison). A humble seaweed just changed what we know about Antarctic as the “isolated continent“. Science Alert. July 17. (Dr Adele Morrison, Prof Andy Hogg). Kelp’s 20,000km Antarctic journey: our last wilderness isn’t so remote after all. NZ Herald. July 17. (Dr Adele Morrison, Prof Andy Hogg – animation). Climate change to worsen urban air quality, lifting death toll. Sydney Morning Herald. Canberra Times, The Age, Brisbane Times. July 16. (Prof Jason Evans). Seaweed off Antarctica has surfed 12,500 miles across the Southern Ocean. The London Economic. July 16. (Dr Adele Morrison). Research: How foreign kelp surfed to Antarctic. Tunis Daily News. July 16. (Dr Adele Morrison). How foreign kelp surfed to Antarctica. Science Daily. July 16. (Dr Adele Morrison). Scorched planet: Global warming could be TWICE as bad as predicted with ‘unstoppable’ sea level rises and a green Sahara Desert. The Sun (UK). July 9. (Prof Katrin Meissner). Earth may get twice as hot as predicted. Deccan Herald. July 9. (Prof Katrin Meissner). Hot topic: Will Theresa May challenge Donald Trump on climate change. Business Green. July 9. (Prof Katrin Meissner). As world busts heat records, study warns global warming could be twice as bad as climate models project. Common Dreams. July 9. (Prof Katrin Meissner). Global warming is lot worse than expected and could turn out twice as bad: New study. International Business Times India. July 8. (Prof Katrin Meissner). Global warming could be double what models predict. I4U News. July 8. (Prof Katrin Meissner). Global warming could be twice as warm as expected. The Advocator. July 7. (Prof Katrin Meissner). Global warming is worse than we thought and could end up double what we predicted. Inquisitr, July 7. (Dr Nerilie Abram, Prof Katrin Meissner). Global temperature increases may be double what models predicted. Earth.com. July 7. (Prof Katrin Meissner). Global warming is going to get worse: new research. The Indian Wire. July 7. (Prof Katrin Meissner). Global warming could be far worse than predicted, new study suggests. USA Today, News Centre Maine, WPXI Pittsbugh, WSB-TV2, FOX23 News. July 6. (Prof Katrin Meissner). Global warming could raise temperatures TWICE as high as previous estimates, with tropical forests set to turn into fire-ravaged savannas, new research warns. Daily Mail. July 6. (Prof Katrin Meissner). Global warming may be twice as hot as climate models projected. Tech Times. July 6. (Prof Katrin Meissner). Study shows global warming will bring profound changes to planet. Digital Journal. July 6. (Prof Katrin Meissner). Research: Past warming events suggest climate models fail to capture true warming under business-as-usual scenarios. TD News. July 6. (Prof Katrin Meissner). Global warming could be far worse than predicted, study suggests. 12News. July 6. (Prof Katrin Meissner). Global warming may be twice what climate models predict. Science Blog. July 6. (Prof Katrin Meissner). Global temperatures could be double those predicted by climate modelling. The Guardian. July 5. (Prof Katrin Meissner). Long term global warming may be double earlier predictions. The Maritime Executive. July 5. (Prof Katrin Meissner). Global warming may be twice what climate models predict. YubaNet. July 5. (Prof Katrin Meissner). The biodiversity benefits of of limiting warming to 1.5C. Australasian Science. July 5. (Dr Andrew King). Model independence day. RealClimate. July 4. (Dr Gab Abramowitz). Warnings from the past. Millennium Post. July 3. (Prof Katrin Meissner). How clouds complicate global warming. Cosmos. July 2. (Prof Christian Jakob). Stepping stones to better climate models. 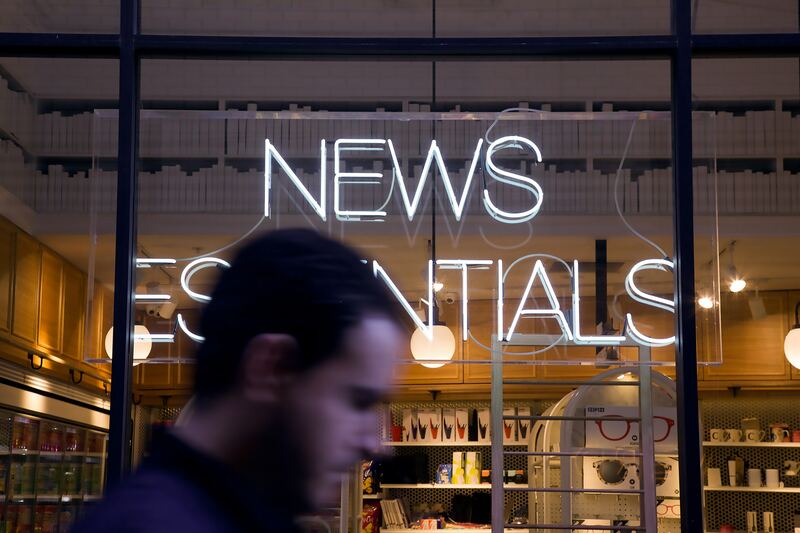 TERN Newsletter. July 1. (Prof Andy Pitman). Is Australia’s current drought caused by climate change? It’s complicated. The Conversation. June 8. (Dr Andrew King, Dr Anna Ukkola, Dr Ben Henley). Limiting global warming to 2 degrees now ‘aspirational’: scientists. Sydney Morning Herald. June 4. (Prof Andy Pitman). Warm regions of world to bear brunt of climate change: study. Telesur. May 31. (Dr Andrew King). Why blowing the 1.5C global warming goal will leave poor tropical nations sweating most of all. The Conversation. May 30. (Dr Andrew King). Global warming hits poorest hardest. Science Daily. May 30. (Dr Andrew King). Poorest hit hard by even low end of the Paris climate temperature goals. Sydney Morning Herald. May 29. (Dr Andrew King). Climate change hits poorest hardest, new research shows. Phys.org. May 29. (Dr Andrew King). Climate ‘highly likely’ a factor in Hobart floods: climatologist. Launceston Examiner. May 16. (Dr Lisa Alexander). Climate change could destroy even the ocean’s most pristine parks. The Atlantic. May 7. (Dr Andrew King). The Australian’s coverage of Great Barrier Reef study creates perception scientists are divided. Climate Feedback. April 22. (Dr Andrew King, Dr Sarah Perkins-Kirkpatrick). Coral on the Great Barrier Reef was ‘cooked’ during 2016 marine heatwave, study finds. 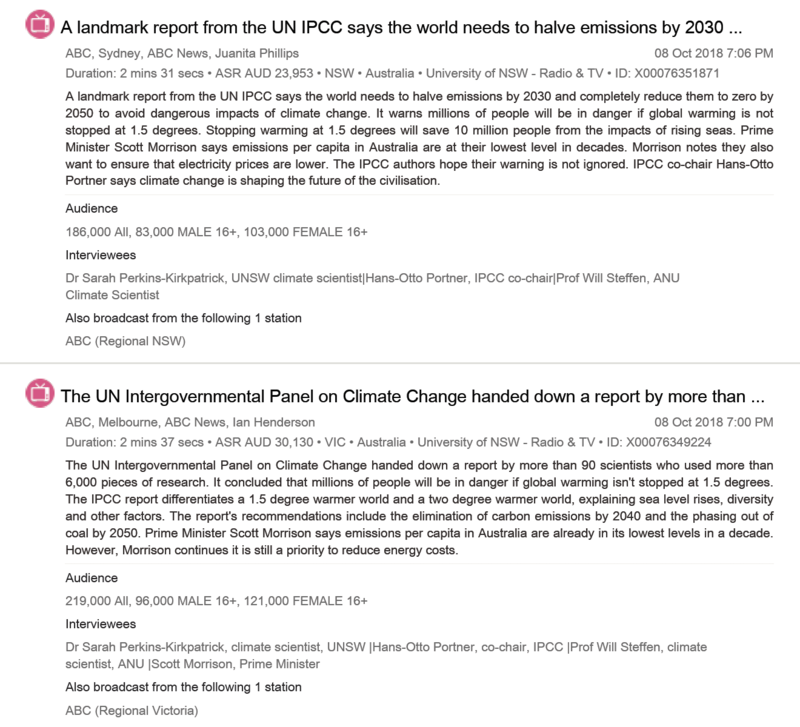 ABC Online, Radio Australia (ABC), MSN News, April 19. (Dr Sarah Perkins-Kirkpatrick). 40 degrees in April: Why this autumn has felt more like summer. ABC Online, ABC Radio, Weatherzone. April 17. (Dr Sarah Perkins-Kirkpatrick). Interview with Dr Ben Henley. Breakfast with Robert Blackmore, 90.3, ABC Sunshine Coast. April 13. (Dr Ben Henley). 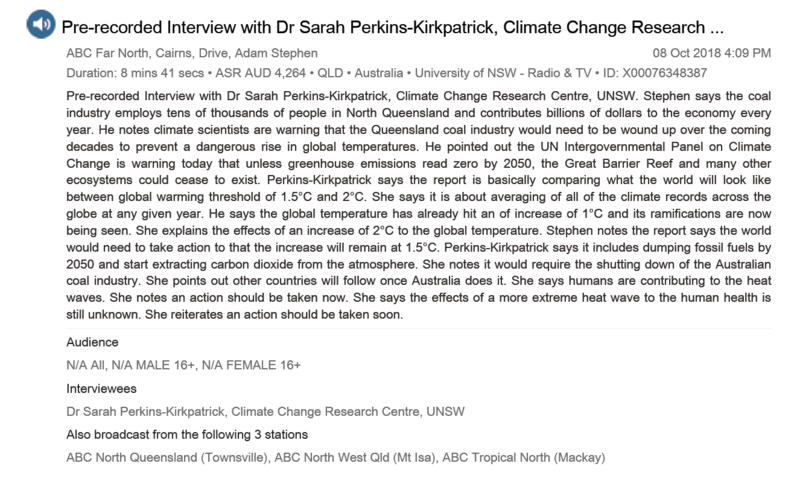 Marine heatwaves interview with Sarah Perkins-Kirkpatrick. ABC Radio Hobart. April 12. (Dr Sarah Perkins-Kirkpatrick). Marine heatwaves interview with Lisa Alexander. Sydney Breakfast. April 12. (Dr Lisa Alexander). Heatwaves over the ocean have ballooned and are wreaking havoc on marine life. The Washington Post. April 11 (CLEX research). Ocean heatwaves are getting worse. Scientific American. April 11. (Dr Eric Oliver). Study suggests marine heatwaves getting more frequent, lasting longer. CTV News Atlantic, The Canadian Press. April 11. (Dr Eric Oliver). Marine heatwaves are lasting longer and hitting more often, research shows. The Toronto Star (Canadian Press), Global News. April 11. (Dr Eric Oliver). Deadly marine heatwaves are increasing in both time and frequency. Mashable Australia. April 11. (CLEX research). Marine heatwaves to grow longer, stronger, more frequent. New Zealand Herald. April 11. (Dr Eric Oliver). Heatwaves in the ocean longer, more frequent. Radio Canada International. April 11. (Dr Eric Oliver). Devastating marine heatwaves increase by 34% in the last century. Climate Action. April 11. (Dr Eric Oliver, Dr Lisa Alexander). ‘Devastating’ ocean heatwaves on the rise. Malaysia Mail Online. April 11. (Dr Eric Oliver). The number of ocean heatwaves has risen more than 50% since 1925, threatening to collapse marine ecosystems. ZME Science, Inhabitat. April 11. (CLEX research). Massive marine heatwaves trigger dangerous effects for ocean ecosystem. Great Lakes Ledger. April 11. (Dr Eric Oliver). Hotter, longer, more frequent: Marine heatwaves on the rise. Eurasia Review. April 11. (Dr Eric Oliver, Prof Neil Holbrook). Ocean temperatures rising: study. Truro Daily News. April 11. (Dr Eric Oliver). Researchers connect the data to show an accelerating trend for marine heatwaves in our oceans. Phys.org. April 11. (Dr Eric Oliver, Prof Neil Holbrook). Global oceans feel the heat: Warming trend worries scientists. Clydebank Post. April 11. (Dr Eric Oliver). Hotter longer marine heatwaves over past century. Scoop NZ. April 11. (Dr Eric Oliver). Marine heatwaves now longer, hotter and more intense. EcoWatch. April 11. (Dr Eric Oliver, Dr Lisa Alexander). Marine heatwaves pose threat to the ecological balance of the seas. Wales 247. April 11. (CLEX research). Hotter, longer, more frequent – marine heatwaves on the rise. Top News. April 11. (Dr Eric Oliver, Prof Neil Holbrook). ‘Concerning’: Marine heatwaves increasing, especially near Australia. Sydney Morning Herald, The Age. April 10. (Dr Lisa Alexander, Dr Sarah Perkins-Kirkpatrick. After a downpour, where does all the water go? ABC Online, The New Daily. April 10. (Dr Ben Henley). Global oceans feel the heat. Irish Times. April 10. (Dr Eric Oliver, Prof Neil Holbrook). Our seas are heating up, here’s why. Stuff NZ, April 10. (Dr Eric Oliver). Devastating ocean heatwaves on the rise. (AFP) Hindustan Times, The South African. April 10. (Dr Eric Oliver, Dr Neil Holbrook). Marine heatwaves the new norm. Carbon News. April 10. (CLEX research). Ocean heatwaves are becoming more common and lasting longer. Science News, April 10. (CLEX research). Ocean heatwaves becoming more common, longer, new study finds. CBC Canada. April 10. (Dr Eric Oliver). Marine heatwaves increasing in intensity. The Maritime Executive. April 10. (Dr Eric Oliver, Prof Neil Holbrook). Marine heatwaves are becoming far more common and intense. Earth.com. April 10. (Dr Eric Oliver, Prof Neil Holbrook). Ocean heatwaves due to global warming have very negative impacts on marine life. Canadian Homesteading. April 10. (Dr Eric Oliver). Marine heatwaves are getting hotter, longer and more frequent. UPI. April 10. (Dr Eric Oliver, Prof Neil Holbrook). Warmer Arctic winters linked to more ‘Snowzillas’ in US north-east. Sydney Morning Herald. March 14. (Dr Amelie Meyer). Arctic a danger zone for scientist trying to unravel disappearing ice mystery. ABC Online. March 3. (Dr Amelie Meyer). Accompanying Facebook video. The freak warm Arctic weather is unusual, but getting less so. The Conversation, The Weather Network. March 2. (Dr Amelie Meyer). High Arctic temperatures break records. Newburgh Gazette. March 2. (Dr Amelie Meyer). ‘Really extreme’ global climate event leaves scientists aghast. Sydney Morning Herald. February 26. (Dr Amelie Meyer, Dr Andrew King). The Arctic is experiencing one of its warmest winters ever as temperatures rise past zero. IFLS, February 26. (Dr Amelie Meyer). Arctic warming deeply concerning, scientists say. Inhabitat. February 26. (Dr Amelie Meyer). Shiny cities, fields can help cool the globe. The Australian, The Daily Telegraph, Northern Territory News, Adelaide Now, Brisbane Courier Mail, Geelong Advertiser, Herald Sun, Gold Coast Bulletin, The Mercury, Townsville Bulletin, Cairns Post, Weekly Times Now, Toowoomba Chronicle. February 1. (Prof Andy Pitman). Making buildings brighter could help cut extreme heat, say Australian researchers. Sydney Morning Herald, The Age . February 1. (Prof Andy Pitman). Making buildings brighter could cut extreme heat, say Australian researchers. Sydney Morning Herald. January 31. (Prof Andy Pitman, Prof Sonia Seneviratne). Don’t shoot the climate change messenger. Sydney Morning Herald, Phys.org. January 24. (ARC Centre of Excellence for Climate Extremes). How climate change is driving extreme heatwaves. Cosmos. January 19. (Prof Andy Pitman). How Australia’s extreme heat might be here to stay. BBC. January 13. (Prof Andy Pitman). Editorial: Another record coming that we don’t want to break. The Age / Sydney Morning Herald, WA Today, Brisbane Times. January 11. (Prof Andy Pitman). Mercury rising: Australia faces an even hotter future. 7:30 ABC TV1. January 11. (Prof Andy Pitman). Deadly heat: How to survive the world’s temperature extremes. New Scientist. January 11. (Prof Steve Sherwood). BoM 2017 Annual Climate Statement (audio unavailable). Bega Breakfast, ABC South East. January 10. (Prof Andy Pitman). ‘Quite surprising’: Near-record hot 2017, heat burst pointing to warmer world. Sydney Morning Herald, The Age, Canberra Times, Brisbane Times, Redland City Bulletin, Illawarra Mercury, North Queensland Register, Queensland Country Life, Stock & Land, WA Today. January 8. (Prof Andy Pitman).